Soi Diana (technically it is Soi 13 off Second Road) stretches for something like 200 meters and within that short stretch of space you'll find lots of quality establishments to keep you entertained throughout the night. 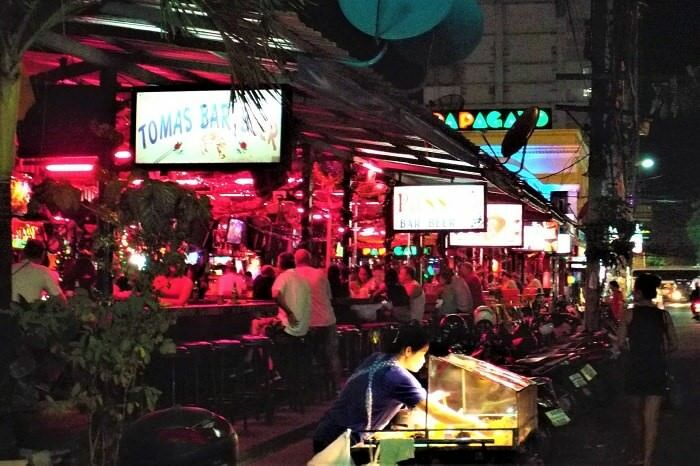 Among these establishments is one of the best coyote bars in Pattaya, a good pool hall, a busy beer bar complex, some quality restaurants, and the best burger I've found in Pattaya! Let's start with a description of the beer bar complex (pictured below). I don't think that the complex as a whole has a name, but it is home to about a dozen or so bars organized into two rows. As always, the row nearest to the road tends to get the lions share of the customers but there are still a few guys who drink on the inside row. The public toilet that services the bars is located behind the complex, and the standard fee in Pattaya of 5 baht applies if you want to use it. The Pattaya girls in this complex are not the best looking, at least not from my own experience, but there is a good atmosphere here with all the usual bar games on offer. Some of the bars that have moved away from the expensive rental locations nearer to the beach have relocated here, with the best known of them being the Cherry Bar (previously located next to 'Best Bar' on Soi 8). The one thing that I don't like about this complex is the relatively high price of the drinks there. You'll need to part with around 80 baht for a beer that will cost no more than 55 baht in an almost identical bar that's located somewhere like Soi New Plaza. Moving past this complex a little further up Soi Diana, you will see the Megabreak Pool Hall. There are lots of tables inside and it is an enclosed building meaning that it is air-conditioned. It's a good place for pool fans to spend a couple of hours, and it is certainly the most popular of the various pool halls around town. As you get towards the opposite end of Soi Diana there's an entrance to Soi LK Metro, which is a must see nightspot if you like semi-naked dancing girls! 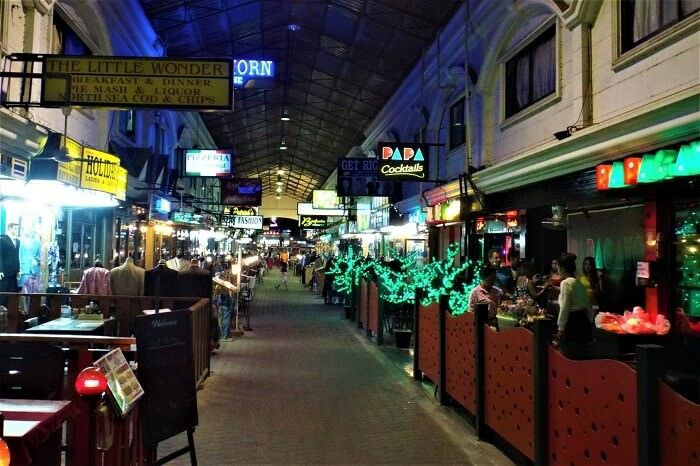 Walking Street is the most popular place to go for a-go-go bars in Pattaya, but Soi LK Metro is definitely a worthy rival and, personally, I prefer it. There aren't as many a-go-go bars to choose from there, but the ones that are there tend to be very good. With these criticisms in mind it's a tough job to recommend any of these venues, but they can still be a decent place for a beer if they get the formula right. To get it right, and justify their prices, there needs to be a really good vibe in these bars, and a few freelancers that are available for take-out won't hurt the formula either. 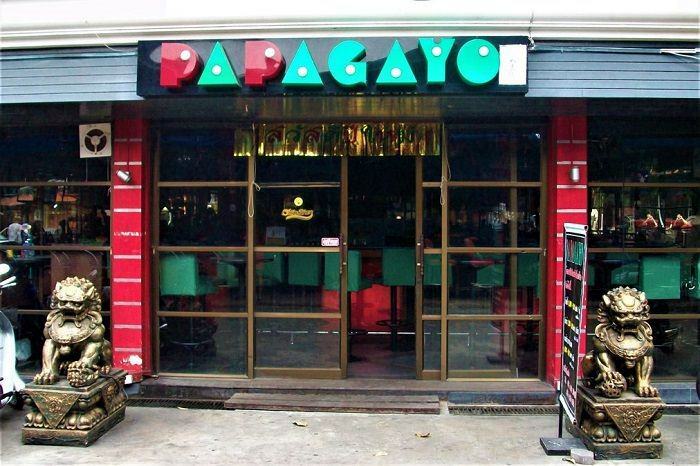 My favourite coyote bar in Pattaya is found on Soi Diana, it is called 'Papagayo' (see picture below). It is one of the first venues you will see as you leave Second Road and head up the soi. At night, Papagayo is a very popular place to go, and the atmosphere inside is a lot of fun. The dancing girls usually look like they are enjoying themselves, and they are playful without being too pushy for lady-drinks. The decor, and the fixtures & fittings, are good quality and there is a good sound system in place. There are some available girls in the bar, and I have myself been approached by some very attractive freelancers there... although you do need to be a good negotiator if you want to avoid paying over the odds for their company. The price of a beer is on the high end, something like 120 baht for a small bottle, but like I said there is a good atmosphere in the bar and many of the girls are very good looking. There are three entrances to the bar, one main entrance as shown in the picture above, and two side doors at opposite ends of the bar. One of the Papagayo entrances opens up onto the 'Central Shopping Arcade' pictured below. This arcade is yet another good feature of Soi Diana. Inside this small arcade you can find lots of different dining options. There is a fast-food place, two Steakhouses, two Indian restaurants, a Belgian restaurant, an Italian restaurant, and a Dutch restaurant. I can recommend the larger of the two Steakhouses i.e. the 'Beefeater Steak House & Bar' but, if you decide to eat there, be sure to book a table in advance if you want to avoid being turned away. The Longhorn Steak House opposite the Beefeater in the arcade is also highly regarded. Whilst I'm on the topic of food, one last thing worth mentioning is the Australian burger stall at the opposite end of Soi Diana. If you like a good hamburger/cheeseburger/Beef roll etc, I recommend you try this place. It is called 'Oz Burgers', and the food there is both cheap and delicious. As well as some fine dining options, Soi Diana has got some top quality hotel options, and they range from simple cheap guesthouses to luxury hotels. Due to the close proximity of Soi LK Metro, which is a big draw these days, there are plenty of guys who like to settle in this part of Pattaya for a few weeks. You can, of course, find guesthouse accommodation directly on LK Metro, but you'll need to be okay with lots of noise every night. 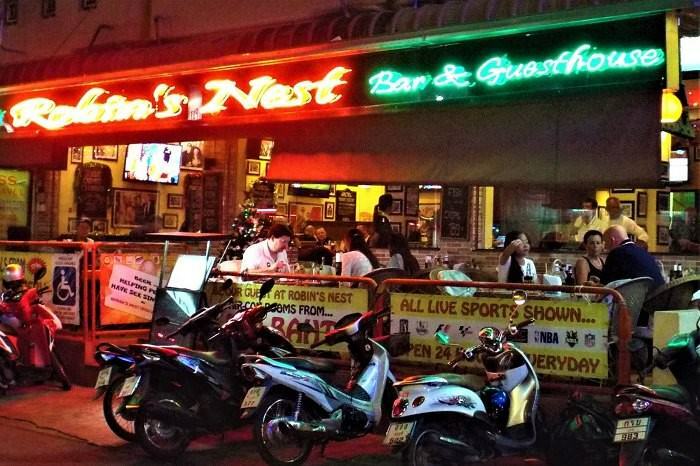 A better alternative, in my opinion, is to go for somewhere like 'Robin's Nest' on Soi Diana (see pic below). The LK Residence is probably the most luxurious in the area and it does have a very good pool area. To get the best out of it I recommend avoiding the cheaper wing of the hotel because it's too separated from the main hotel facilities. The Areca Lodge is my recommendation as it more or less matches the LK Residence for luxury whilst being that bit cheaper. The rooms are also set back from the noisy action on Soi Diana, which ensures a peaceful night when you want to sleep. For anyone wondering about the Diana Hotel (after which the soi is named), it no longer exists. It first changed ownership and its name to become the 'Boss Suites' hotel, but more recently the whole structure has been demolished to make way for a new condominium block. I never got to stay at the Diana Hotel, I missed out on that particular piece of Pattaya history, but regardless of the hotel's demise the soi will no doubt retain it's name into perpetuity. That's almost it for this soi review, after the Oz Burgers stall that I mentioned you are virtually on Soi Buakhao. I suppose the last thing to mention is that 'Nikom Court' is located at the intersection of Soi Buakhao and Soi Diana, and you can eat your Oz burgers in there with a beer. All together, Soi Diana is a really good place to go and well worth a visit. With LK Metro and Soi Buakhao in close proximity, the overall area makes for a very good night out, and a good alternative to the better known Pattaya nightlife options.